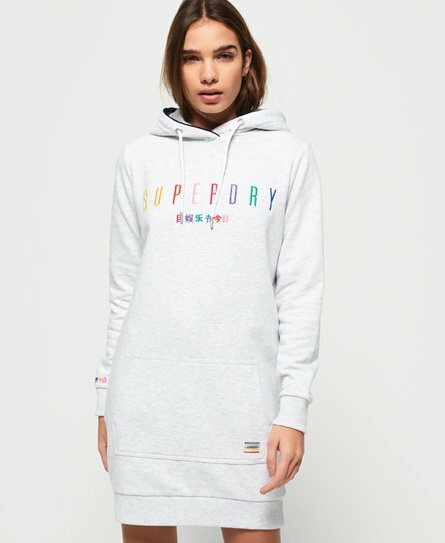 Superdry women’s rainbow tape sweat dress. Dress to impress in this rainbow sweat dress, this is a comfy, yet stylish addition to any wardrobe this season. It features a draw cord hood with rainbow tape lining, a Superdry logo embroidered across the chest and Japanese inspired graphics on the sleeve. In addition, this dress has ribbed trims throughout for a comfy fit, as well as a large front pocket. For the finishing touch, this dress has a Superdry patch on the pocket for a quality look. Style this dress with your favourite trainers this season for an easy go to piece.